We’re already a week into December and the holiday season is in full swing. Don’t you just love waking up on Christmas morning and finding your presents under the tree? That’s the feeling I have every month when my Fairyloot arrives! I mean, sure, I paid for it myself and all that, but it’s still a surprise what I’m getting. 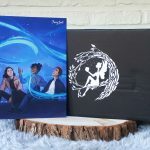 So let’s see what was in the Fairyloot November 2018 box! The theme this time was “Battles and Galaxies”. 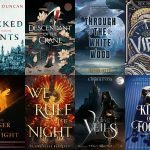 I prefer dragons over spaceships, but still enjoy a good science-fiction adventure. And we’re off to a great start to this box with the spoiler card, which comes with artwork by Taratjah. I love the colours and the flying space debris! When you say “science-fiction”, you say “travel to other galaxies”. That might not be possible for us humans yet, but there’s plenty of places to visit here on Earth as well. To keep your passport safe, you can now use this exclusive passport cover! 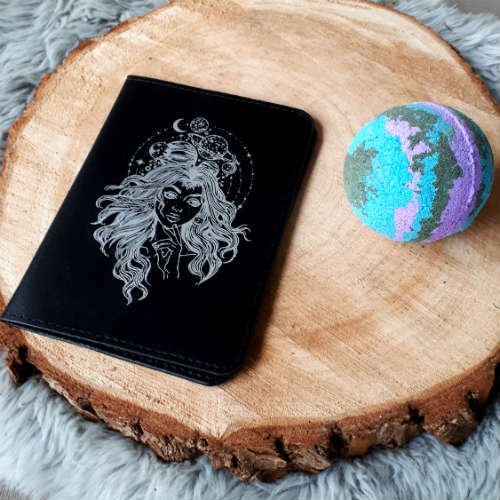 It features a drawing of a woman surrounded by the Moon and the planets of our solar system. I’m pretty sure everyone will be jealous of you when you pull this out of your bag at the airport! As the holidays are approaching, it’s time to set up our decorations. And this time, we can add this cute wooden ornament, designed by Catarina’s Book Designs. It reads “It is not in the stars to hold our destiny, but in ourselves”. This is a paraphrase of “The fault, dear Brutus, is not in our stars, but in ourselves, that we are underlings” by the one and only William Shakespeare. It’s a rather loose paraphrase, but it definitely sounds less gloomy than the original! One of my favourite scifi series is The Lunar Chronicles by Marissa Meyer. 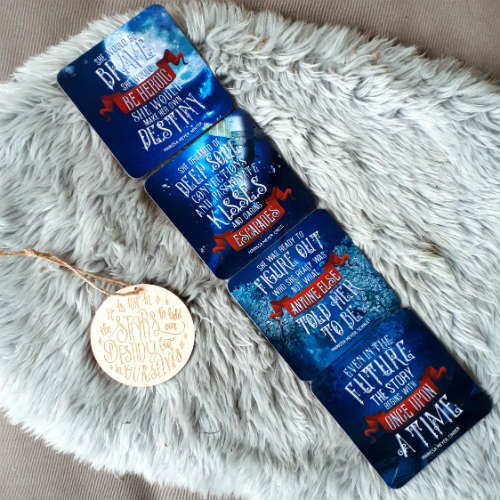 So you can imagine how happy I was when I opened up this little black box and discovered four coasters inspired by the series. There’s one for every book and they all feature a quote. Even better: when you line them up, you’ll notice they form a continuous picture. How amazing is that?! 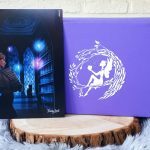 The next item is something that I’d been meaning to buy myself for a while, so you can imagine my surprise when I found it in a book subscription box! 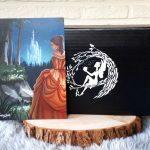 Which shows how wonderfully creative the Fairyloot team is (or it just illustrates my lack of imagination, you decide). Anyway, I now have my own reusable drinking straws! I rarely use plastic straws, because they’re bad for the environment, but I was thinking of buying some reusable ones to drink my milkshakes and smoothies. But these are so pretty! Look at those shiny colours! They come with an inscription (“reach for the stars” and “shine bright”) and a little brush to clean them after use. Up next we have an iron-on patch. As I’ve said before, I’m not a big fan of these, since I never use them. Add the fact that I haven’t read Red Rising, by which the patch is inspired, and you can probably understand why it’s my least favourite item in this box. 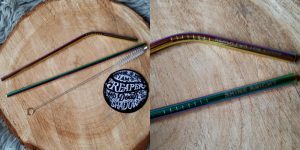 Not that it’s bad, to be clear, the design by KDP Letters still looks great, and the quote “I am the reaper and death is my shadow” sounds fierce! I might read this book in the future, and who knows, maybe I’ll end up loving this patch because of it? 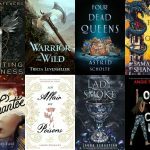 Before we move on to the featured book, there’s a nice little surprise waiting for us. 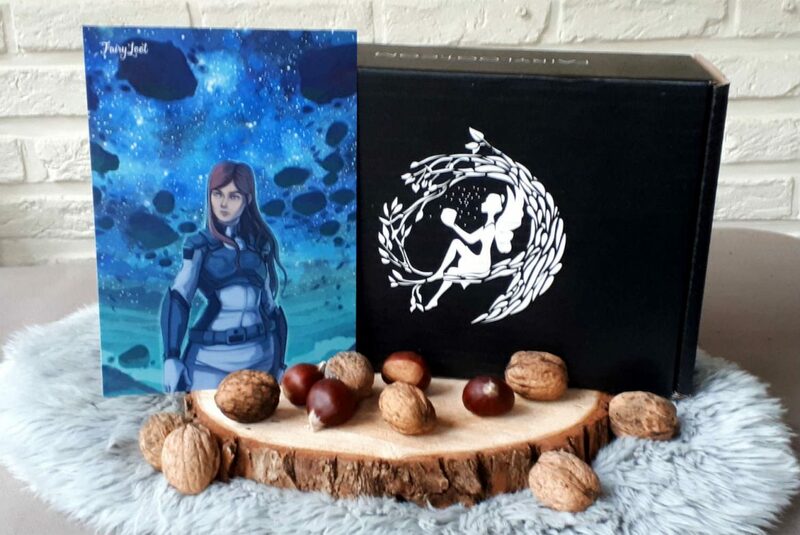 A little card with artwork, with on the back a link to a secret webpage where Fairyloot buyers can download a free ebook copy of Atlas Fallen by Jessica Pierce! 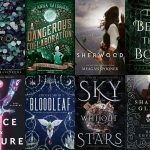 This book gets pretty good reviews on Goodreads, so I can’t wait to read it myself. I know Brandon Sanderson is a huge name in fantasy literature, but so far the only of his books I’ve read are the final parts of the Wheel of Time series, which he took over from Robert Jordan after the latter passed away. So you could say this will be my first time reading a “true” Sanderson book. My copy comes with yellow sprayed edges, like it does for most of the world. But Fairyloot buyers in the USA and Canada received a copy that was signed by the author, if I’m not mistaken. I’m a sucker for sprayed edges, so I’m really happy with my edition! 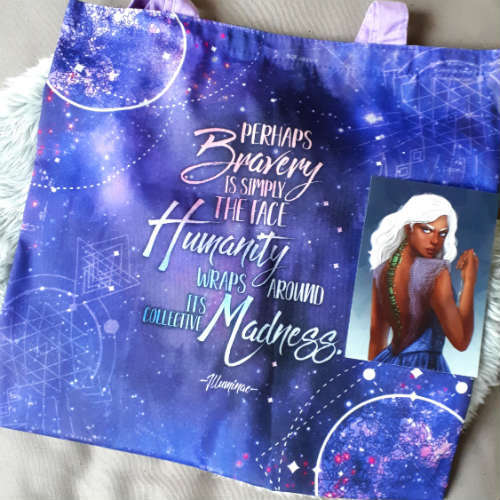 The book comes with a letter from the author, with on the back character art by Morgana0anagrom. 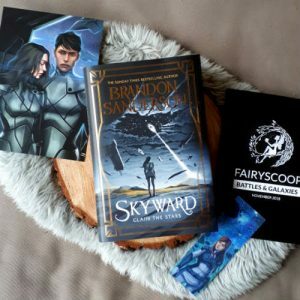 There’s also a bookmark featuring Fairyloot’s monthly art and the Fairyscoop newsletter, which includes a crossword puzzle with a chance to win your next box for free! 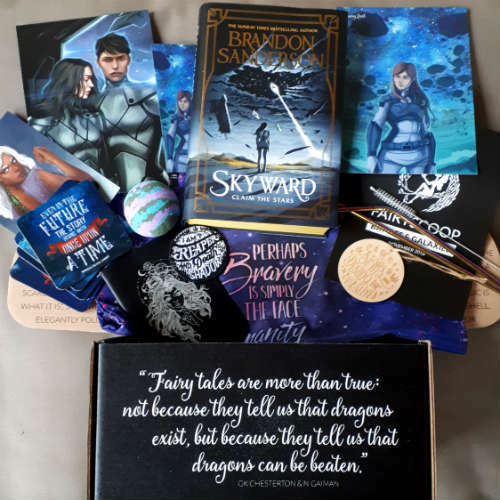 There you go, that was everything that came in the Fairyloot November 2018 box. What was your favourite item? Let me know in the comments!